There are actually a number of posts and video that rank highly in google search results for doing this, but none of them explicitly state all the requirement to make this work. Since I just spent the effort to configure it like I want it, I'll dump it here (mainly for my own benefit since I'll forget what I did). This is using the screen sharing application in Apple CoreServices. 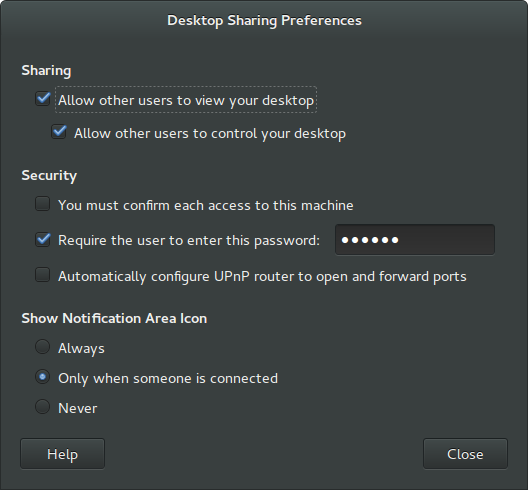 If you are on an unsecure network, don't do this because it requires disabling encryption. 2. 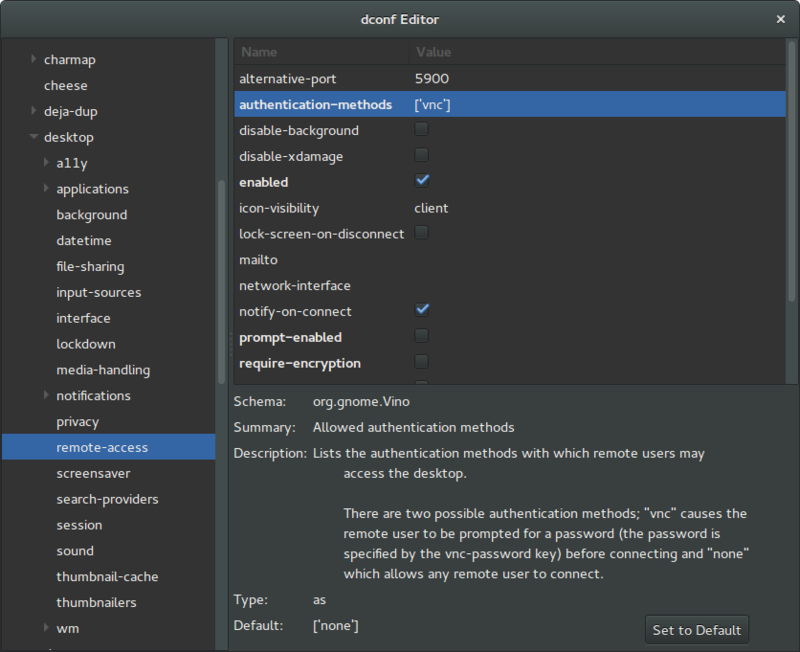 Open dconf editor and navigate to org > gnome > desktop > remote-access. Here you will make TWO changes. Most all the posts I saw only mentioned one change. b. change authentication-methods from 'none' to 'vnc'. Do not select "set to default"
While a VNC client can connect with no authentication, mac OS expects a password, and attempts to connect will just hang if you don't set this. 3. from a terminal run vino-preferences and select "Require the user to enter this password:" and type in a password of your choosing. vino broadcasts a hard-coded user@host name through zeroconf (avahi), meaning that in the mac finder sidebar, you get a separate entry for each service broadcast from the Ubuntu box. This is a rather annoying and old "feature". There's a nice workaround here that disables automatic broadcasting. You then create separate entries for each service using only the host name. This allows all of these to be grouped together under one "computer" icon in the finder sidebar. while remembering to uncomment the line (which I forgot to do the first time). Next, create a vnc.service file (don't misspell the file name like I did and wonder why it doesn't work). I have been weary of new versions of the Mac OS since 10.7 Lion removed a ton of functionality. I could care less about iOS, and think that merging desktop and mobile OS is, at this point, a bad idea (especially when that desktop is used for work). Mac OS 10.9 Mavericks was a step in the right direction, but I was not at all interested in moving to 10.10 Yosemite. Then I bought a new mac with it installed. 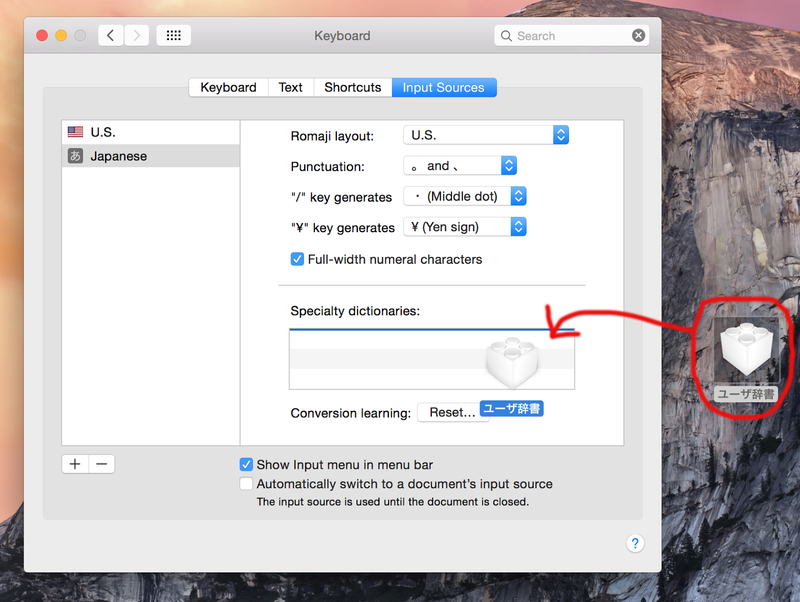 Next, I discovered that "koteri" （ことえり）Apple's Japanese IME had been unceremoniously replaced. I guess that's fine. Kotoeri really wasn't that good. A lot of folks used ATOK. For kotoeri users, though, there was no clear instructions on how to move your user dictionary. All I could find was this unhelpful page on Apple's site. In fact, an English-language brought me zero solutions. However, the first hit on a Japanese-language search contained the answer. 3. 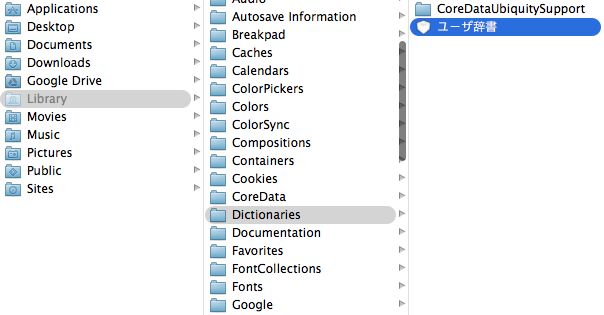 Scroll down to the very bottom to "Specialty dictionaries", and drag and drop the ユーザ辞書 bundle into the input field. The location of the ユーザ辞書 bundle. Drag and drop the ユーザ辞書 bundle into "Specialty dictionaries".